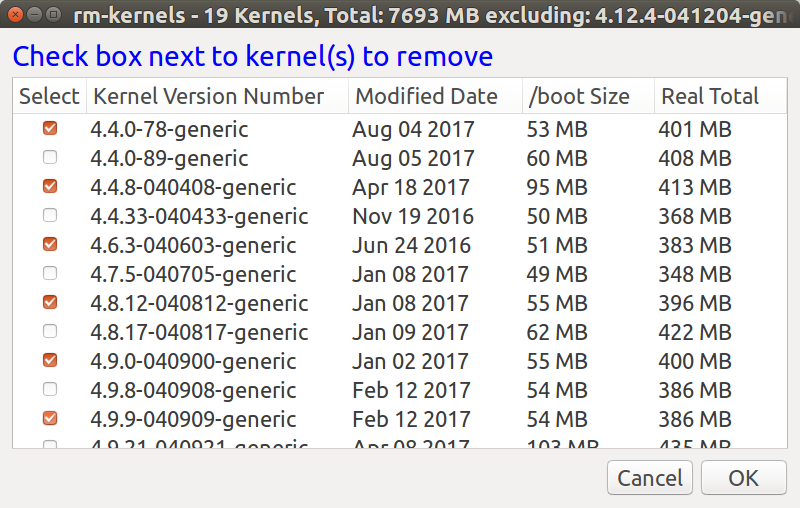 The highly rated Q&A How do I remove old kernel versions to clean up the boot menu? doesn't provide an easy way to selectively purge older kernels unless extra applications are installed ie Ubuntu-Tweak. The Bash one-liner to delete only old kernels Q&A gives a "purge everything old" solution but I want to keep the last kernel in each generation. ie remove 4.7.1, 4.7.2... but keep 4.7.5. 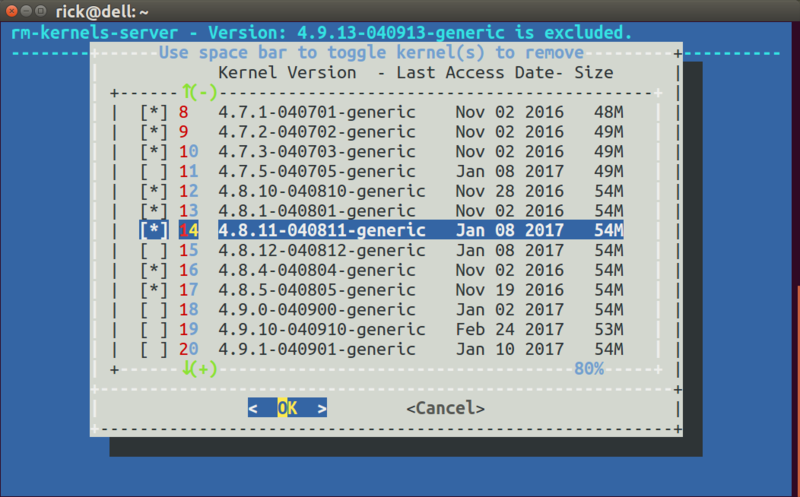 Is there a way to scroll through a list of all installed kernels and select specific ones to purge? It should not allow purging of currently running kernel. The advantage of this answer is native Ubuntu Bash is used without installing third-party applications. Users of custom kernels who didn't use apt or dpkg can change this bash script to suit their needs. 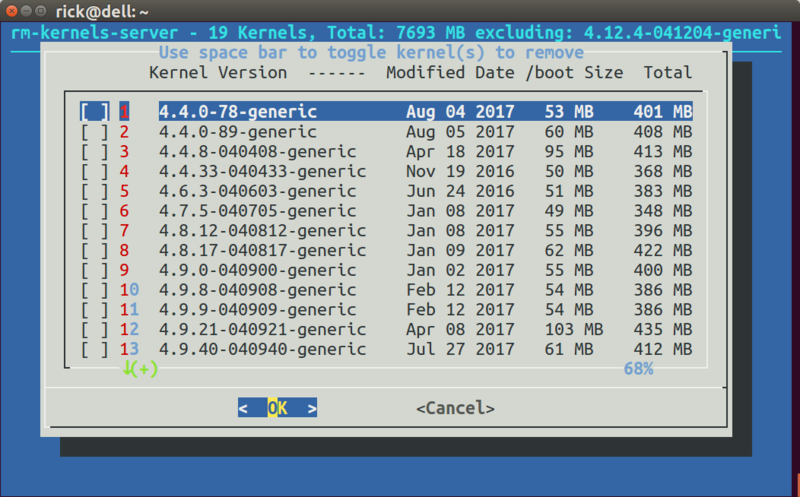 The dialog title reports the number of kernels, their total size and the current kernel version booted. The current kernel is excluded from the title's totals and does not appear the kernel list. The Modified Date is normally the date the kernel was released. On my system that date is "touched" every time the kernel is booted using a cron reboot script (How do you find out when a specific kernel version was last booted?). For each kernel its size within the /boot directory is reported. Then the kernel's total size is summed for the three directories; /boot, /usr/src/kernel_version and /lib/modules/kernel_version. If no parameter is passed to rm-kernels the total size is estimated and the title shows "Est. Total". This saves time running the du command which can take 30 seconds to 90 minutes depending on how many kernels you have and whether you have an SSD or an HDD. If you pass any parameter at all then du is used to obtain kernel sizes and the title shows "Real Total" as the sample screen above illustrates. 0 upgraded, 0 newly installed, 19 to remove and 1 not upgraded. After this operation, 1,794 MB disk space will be freed. apt purge reports 1,784 MB will be freed but the real total 2,379 MB. I don't know why it is different. Rather than purging kernels one at a time and update-grub being repetitively called in time-consuming loop, the selections are purged all at once. # DATE: Mar 10, 2017. Modified Aug 5, 2017. #       the first `du` command averages about 20 seconds per kernel. #       the second `du` command averages about 2.5 seconds per kernel. > ~/.rm-kernels-plain # Empty any existing file. NOTE: You need to use sudo powers to save the file with your favorite editor. The calculated size of each kernel was taken from /boot/*kernel_version* which were 5 files totaling ~50 MB. The formula has changed to include the files in /usr/src/*kernel_version* and /lib/modules/*kernel_version*. The calculated size for each kernel is now ~400 MB. The default is to estimate the size of files for linux-headers at 125 MB and linux-image at 220 MB because du can be painfully slow unless files are in cached in memory. To get the real size using du pass any parameter to the script. The kernel list is now sorted by Kernel Version rather than alpha-numerically. An additional column has been added for /boot size. In the graphical Zenity version the last column changes between "Real Total" and "Est. Total" (Estimated) depending on parameter 1 being passed or not. Not the answer you're looking for? Browse other questions tagged boot apt grub2 kernel or ask your own question. What is the lastest stable kernel and how to install it? how do I uninstall old kernel options listed in Grub2?